Amyloodinium ocellatum, commonly referred to as “velvet,” is a single celled dinoflagellate. It is sometimes referred to as a hybrid, having characteristics of both plants and animals. However, for marine aquarists it is a feared pathogen with a reputation for being capable of wiping out an entire fish population in just a matter of days. Velvet has a lifecycle similar to that of Cryptocaryon irritans (ich). Even the terminology used is mostly the same – except velvet “free swimmers” are referred to as dinospores instead of theronts. Velvet’s lifecycle is typically faster (completed in 4 days on average), and the attacking free swimmers are more numerous than ich. Also, velvet dinospores can remain infective for up to 15 days, whereas with ich theronts it’s only 48 hours. This is because velvet tomonts and dinospores are both capable of using photosynthesis as a means of obtaining nutrients (remember it is a dinoflagellate). Swimming into the flow of a powerhead (unique to velvet). Acting reclusive (velvet causes fish to be sensitive to light). 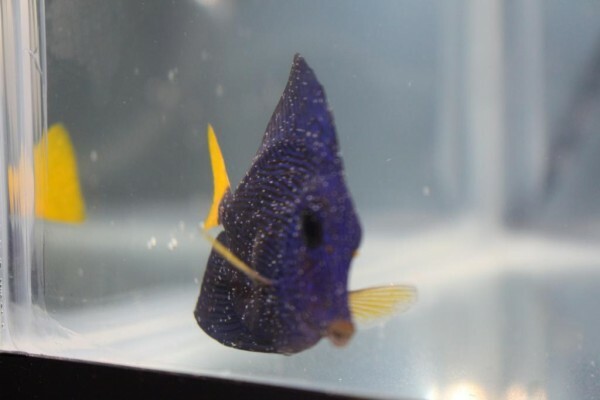 Velvet may initially start out looking just like ich, with salt or sugar-like “sprinkles” visible mostly on the fins. Within days or sometimes just hours, these tiny white dots will spread all over the fish’s body, covering it in “dust.” This dust may look grey-gold colored if viewed at the right angle and under the right spectrum of light. 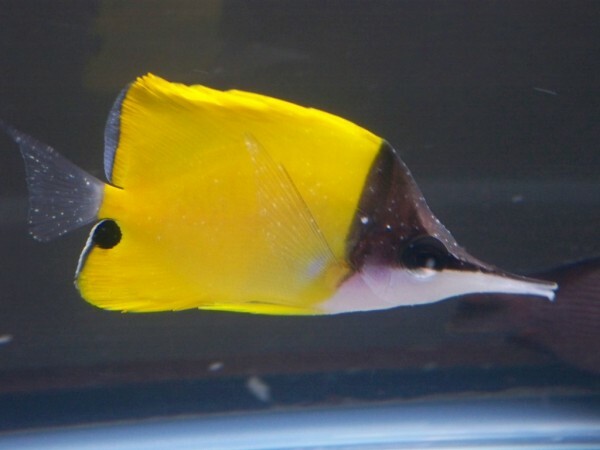 For this reason, it may be difficult to see velvet on a yellow or light colored fish (look from an angle, not directly from the side). However, sometimes a fish’s body will look “dirty” or show “dark areas” just before velvet appears. Velvet trophonts (and the correlating dots) are much smaller than ich. They range in size from 10-80 micrometers in diameter. They are also perfectly round. Ich trophonts are more oval shaped and range in size from 48 x 27 to 452 x 360 micrometers. Both start off small but then grow in size before dropping off. It has been said that velvet makes a fish look like it has been dusted with a fine powder, whereas ich is more like salt grains. If you can count the number of white dots on your fish, then you are probably dealing with ich. If they are too numerous to count, it is most likely velvet. The importance of recognizing key behavioral symptoms of velvet and then beginning treatment immediately cannot be stressed enough. This is because once velvet has spread to the body, the fish is heavily infected and prognosis is bleak. However, I will demonstrate below that this is not always the case. Velvet cannot usually be managed, as ich sometimes is, due to its sheer overwhelming numbers. Survivors of velvet are usually clownfish or other fish with thick mucus coats. It is also thought a very small percentage of fish are capable of building up either natural or temporary immunity (usually 6 months max) to velvet. Treatment options – Chloroquine phosphate is the treatment of choice for velvet, but copper also works if symptoms are caught early on. These also work on ich, so if in doubt treating with CP or copper will have you covered both ways. Tank transfer and hyposalinity do not work with velvet. A freshwater dip and/or chemical bath (discussed in more detail below) is recommended either before or during treatment, due to the severity of this disease; however these would only provide temporary relief and will not eradicate velvet. Fallow period – 6 weeks if you are certain it is velvet. However, if you suspect ich or any other disease(s) may be lingering in your display tank, then it is best to go fallow for 76 days. Acriflavine (preferred) – Do the bath for 75-90 minutes, but remove the fish immediately at the first sign of distress. Aerate heavily both before & during the bath, and temperature control the water. The following products contain acriflavine: Acriflavine-MS and Ruby Reef Rally. DO NOTmix acriflavine with any other chemicals. After the bath, place the fish in a QT pre-dosed at 80mg/gal using Chloroquine phosphate. In theory, copper (exs. Cupramine, Coppersafe,Copper Power) should work just as well as CP. However, due to how fast velvet can reproduce you don’t have the luxury of slowly ramping up the copper level as is normally advised. Therefore, the fish needs to be placed in a QT with copper already at minimum therapeutic levels. This is the advantage CP has over copper in this particular situation. While in QT, use a wide spectrum antibiotic (exs. Seachem Kanaplex, Furan-2) for the first week to ward off any possible bacterial infections. 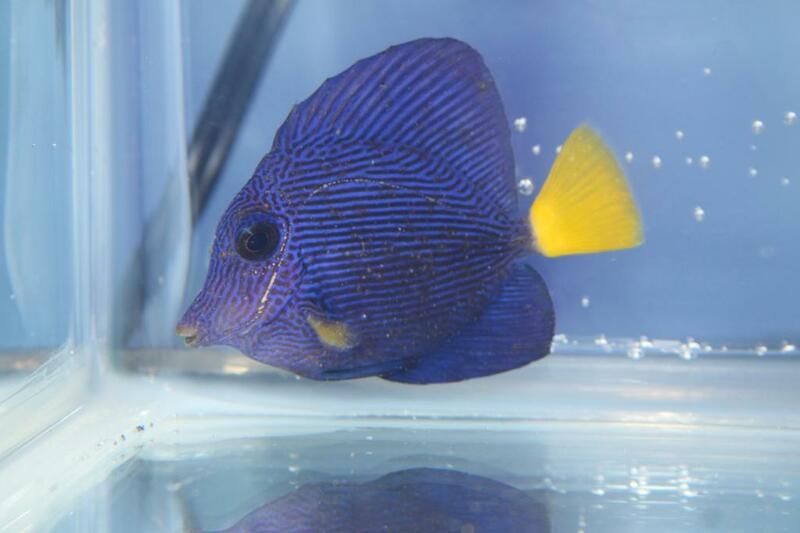 Secondary bacterial infections are very common in fish with preexisting parasitic infestations such as velvet. 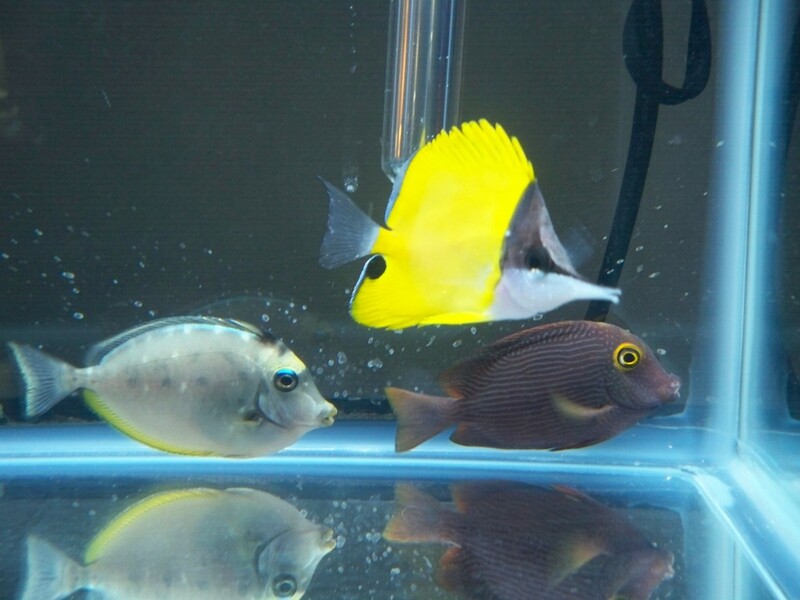 Keep the fish in CP or copper (at therapeutic levels) for one month. However, you can transfer the fish into a non-medicated holding tank for observation after just two weeks (explained below). DO NOT lower the CP or copper level before transferring. Fill a bucket with RODI water, and use a heater to match the temperature to the water the fish is coming from. Aerate the water heavily for at least 30 minutes prior to doing the dip, then discontinue aeration while performing the dip. Fish aren’t overly pH sensitive for short durations like this, but you can squirt a little tank water into the dip just before the fish goes in to help bring it up. Place the fish in the freshwater (FW) dip and observe closely. It is not unusual for them to freak out a little at first. 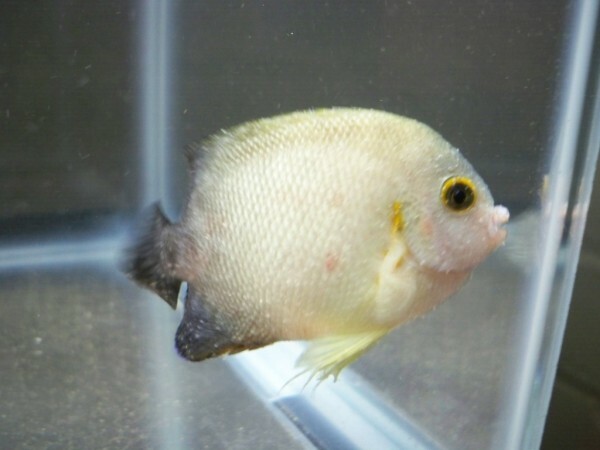 Also, tangs are notorious for “playing dead” during a FW dip. The important thing is to watch their gills; they should be breathing heavily at all times during the dip. If breathing slows, it’s time to exit the dip. Dip the fish for no longer than 5 minutes. Acriflavine – This is a new drug (to me anyway), but it seems to have a lot of potential as a replacement for formalin. It has a broad range of effect, being effective against both protozoans and bacterial infections. The latter gives it an advantage over using formalin, because all those tiny bite marks inflicted by velvet have the potential to get infected. You can also leave a fish in acriflavine longer than formalin, because it is not as harsh on the fish. Dosage varies by the product you are using, but for straight acriflavine (Acriflavine-MS) use 1 teaspoon per 5 gallons of water for a bath solution. Formalin – Cheap, effective and readily available; formalin can sometimes even be sourced from a vet or local pharmacy (37% Formaldehyde is what you’re looking for). However, the downsides are numerous: First, it can be very harsh – some fish cannot even survive in it the full 60 minutes. Formalin will quickly deplete oxygen from the water, so it’s important to aerate heavily for 30 minutes before and also during the bath treatment. The bath should be done in a large glass bowl/container or small aquarium, as plastic may absorb some of the medication and then leach it back out during future use. Finally, formalin is a known carcinogen, so precautions must be taken when handling it. Prevent your skin from coming into contact with it by wearing waterproof gloves, and protect your face by wearing a face mask and eye protection. Even though I lost the butterfly I had treated with formalin, I still wanted to include it as a chemical bath option. 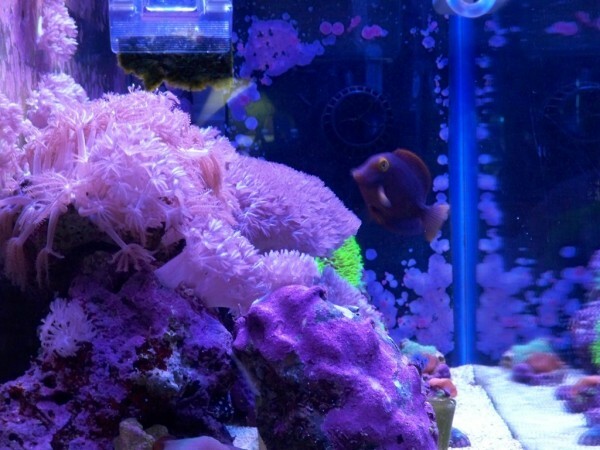 In the past, I have successfully treated clownfish with Brooklynella by using formalin and also know those who have been successful using it to treat velvet as well, so it is not without its merits. However, there is anecdotal evidence that some fish treated with formalin will suddenly stop eating at a later date. So, similar to cyanide poisoning. I’ve also read that many fish treated with formalin do not live past 18-24 months, possibly dying of cancer. However, when faced with velvet and if formalin is your only viable option, 18-24 months is a hell of a lot better than just letting the fish die in a matter of days or even hours. Methylene Blue – May be added to the formalin bath only. It is a healing agent, useful for treating the tiny bite marks inflicted by velvet. Chloroquine phosphate/copper – While all of the above will remove the vast majority of velvet on a fish, some will inevitably survive. Within 4 days the remaining trophonts will drop off the fish, then encyst, and usually 48-96 hours later (although it can take up to 20+ days depending upon the strain) release dinospores (free swimmers) seeking to reinfect fish. The presence of CP or copper at therapeutic levels kills the dinospores, effectively shielding your fish from reinfection. It is important to note that CP/copper does not eradicate any other stage of velvet, just dinospores. It has zero impact on the parasites on the fish; they must “weather the storm” until the trophonts fall off. This is why it is so important to do a freshwater dip and chemical bath beforehand, to reduce the number of parasites feeding on your fish’s body & gills. As mentioned in “The short version”, if you only have one QT to work with leave the fish in CP or copper for one month before performing water changes/running carbon. This will ensure the fish has been protected from reinfection before removing the medication. However, if you can transfer the fish to a non-medicated holding tank (at least 10 feet away from the QT) for observation then you may do so just 10-14 days after CP/copper treatment has begun. So long as therapeutic levels were continuously maintained for the 10-14 day period. 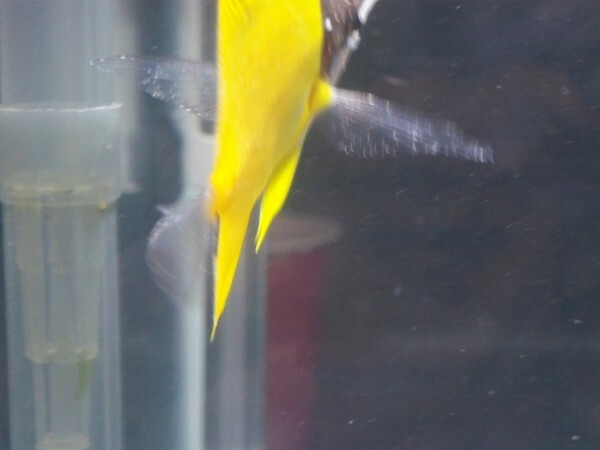 Transfer nothing but the fish, and even as little water as possible with the fish (like doing Tank Transfer Method). DO NOT lower the CP or copper level before transferring, as that is “the shield” protecting the fish from reinfection. Once transferred, your fish should have a “clean slate” in his new environment and have left behind all the velvet problems in the QT. Observe for at least 2 weeks before declaring your fish to be velvet free! Chloroquine is considered the treatment of choice for velvet, because you can go from zero to full therapeutic all in one dose, without negatively affecting the fish. This is not the case with copper, as some fish can be overly sensitive to it and sometimes stop eating or even die. But with velvet, that’s a risk you’re just going to have to take if copper is the only viable option. Also, with CP anything from 40-80mg/gal should get the job done where velvet is concerned. I just dosed at the high end for my experiment, because I saw no downside in doing so. Wide spectrum antibiotic – Velvet does A LOT of damage to a fish’s skin & gills. The trophont sits on the skin’s surface and puts out small rhyzoids (root-like structures) into the skin of the host where it absorbs nutrients directly from the fish’s skin. With all those tiny wounds, the likelihood of infection is high. This is something I missed in my earlier experiments where the fish died. Therefore, I consider it prudent to preemptively treat withKanaplex and/or Furan-2 to ward off any potential bacterial infections which might arise. You need to move with a sense of urgency when a fish has velvet. This is not the same as dealing with ich. 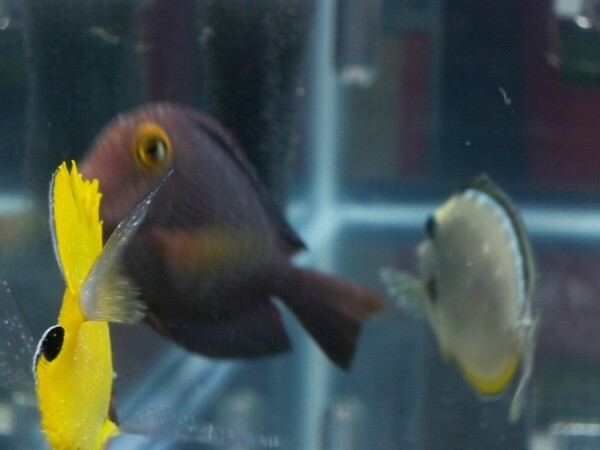 A fish with velvet may have days or just hours to live without prompt treatment. A small percentage of fish are thought to be capable of building up a natural or temporary immunity to velvet (and perhaps other parasites as well). Natural immunity is less understood, but temporary immunity usually only lasts 6 months max. During that time the fish is still a carrier and capable of infecting other fish. Over the years I have noticed this trend: Clownfish, mandarins and other fish with thick slime coats are often the only fish left standing following a velvet wipeout. Disease masking: There is some anecdotal evidence to suggest that fish treated with a non-therapeutic level of copper will not show symptoms of ich, velvet, brook, etc. for weeks. This is why it can be dangerous to buy from LFS who treat their fish with copper but do not test daily to ensure it remains within the therapeutic range. The lifecycle of velvet varies according to strain. The trophonts, which feed and do all the damage, can remain on a fish for as little as 12 hours or as long as 4 days. Common sense dictates you are more likely to save a fish with velvet if it’s a “12 hour variant” than one which feeds on the fish for 4 consecutive days, since the medication will not kill the trophonts still on the fish. Even after completing the freshwater dip and chemical bath, you will still see tiny dots all over the fish. This is because the dots you see are not the actual parasites. Velvet, like ich, is invisible to the naked eye in all forms. The dots or “dust” you are seeing is actually excess mucous buildup around the tiny insertion points. It will take a few days for this to diminish. If you can’t get acriflavine or formalin right away, daily freshwater dips may buy you more time. However, I’ve never saved a fish just by doing freshwater dips and then treating with copper or CP. As mentioned previously, velvet dinospores (free swimmers) can remain infective for up to 15 days. By contrast, ich theronts only remain active for 48 hours, with infectivity greatly reduced just 6 – 8 hours after it leaves the cyst. What this means is that velvet has a lot more time to seek out and attach to a fish host, which partially explains why a fish with velvet is often covered in it. Velvet doesn’t take much of a break. Velvet tomonts release free swimmers every 4 days (on average). As mentioned above, those free swimmers can hang around for up to 15 days looking for fish to infect. Ich tomonts only release theronts (free swimmers) every 2-4 weeks (on average), with at least one strain taking up to 72 days. Since the trophont (feeding stage) remains on the fish for 3-7 days before dropping off, a fish with ich gets some relief in-between bombardments. Velvet likes light. As a dinoflagellate, velvet tomonts and dinospores are both capable of using photosynthesis as a means of obtaining energy. So when a dinospore ruptures from its cyst, it propels upward (towards the light) by using whip-like appendages for locomotion. Therefore, top swimming fish are probably more at risk than bottom dwellers. I highly suggest not using an aquarium light during treatment and also when running fallow for velvet (if possible in a fish only system). 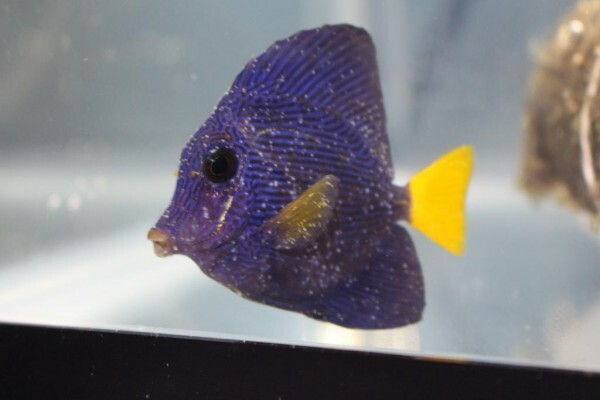 If you have questions or need more information on diagnosing or treating Marine Velvet or other saltwater fish disease, check out the Fish Disease Treatment & Diagnosis forum on REEF2REEF. 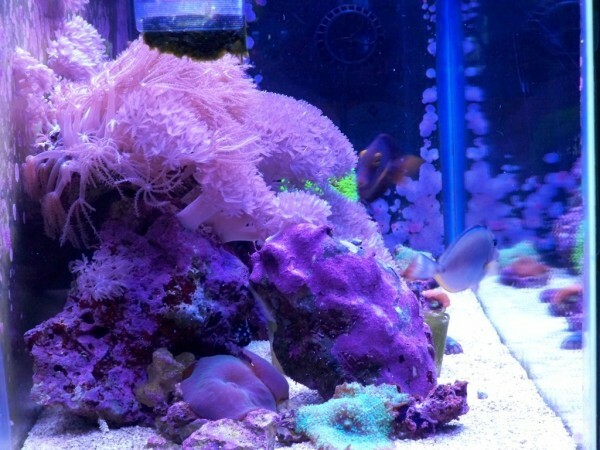 Bobby Miller has been keeping marine aquariums since 1979, at the tender age of 5 (with help from his father of course ). 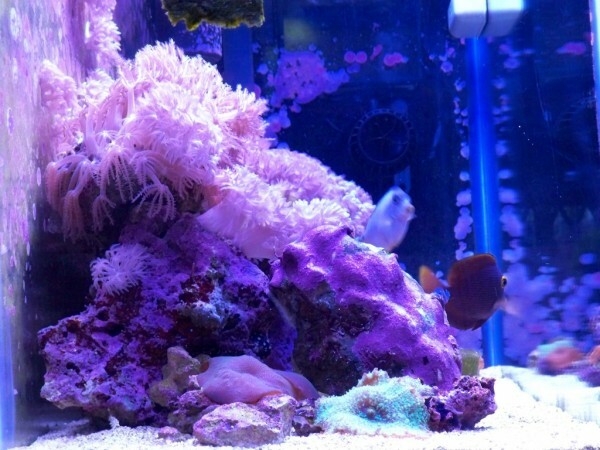 Being in the hobby for this long has afforded him the opportunity to keep just about every type of saltwater tank there is, as well as work in both retail and maintenance. 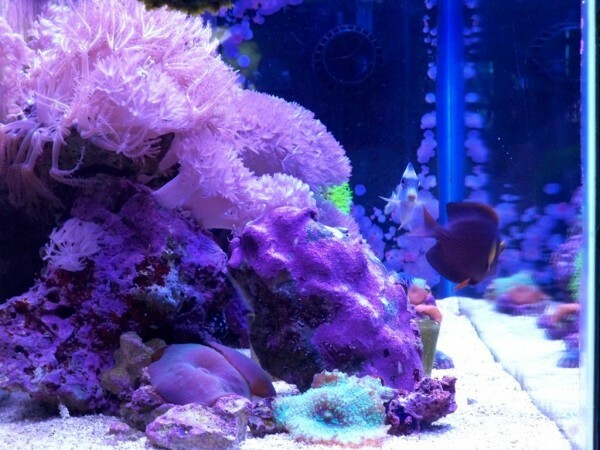 Around 6 years ago Bobby focused all of his attention on studying fish diseases and this is the area of the hobby which interests him the most.